The REST API allows third-party applications to retrive data stored within BIGSdb databases or to send new submissions to database curators. To use the REST API, your application will make a HTTP request and parse the response. The response format is JSON (except for routes that request a FASTA or CSV file). Access to protected resources, i.e. 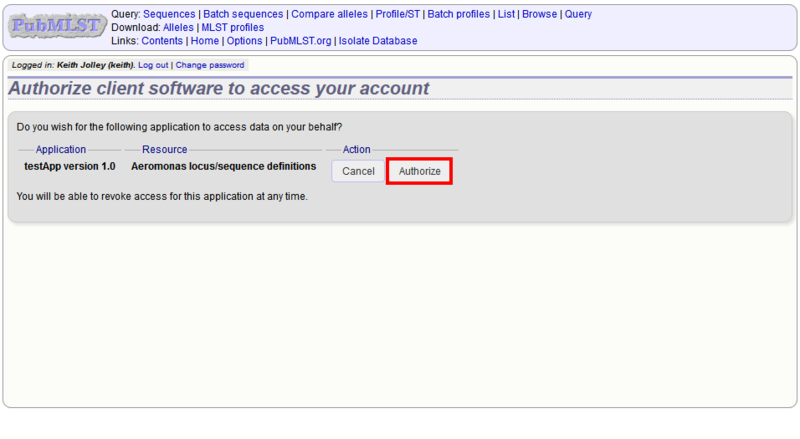 those requiring an account, can be accessed via the API using OAuth authentication. If you are using a method called with GET, optional parameters can be passed as arguments to the query URL by adding a ‘?’ followed by the first argument and its value (separated by a ‘=’). Additional parameters are separated by a ‘&’, e.g. Methods called with POST require their arguments to be sent as JSON within the post body. These will vary depending on whether the resource is an isolate or a sequence definition database. return_all [integer] - Set to non-zero value to disable paging. records [int] - Number of loci. loci [array] - List of URIs to defined locus records. Pages are 100 records by default. Page size can be modified using the page_size parameter. 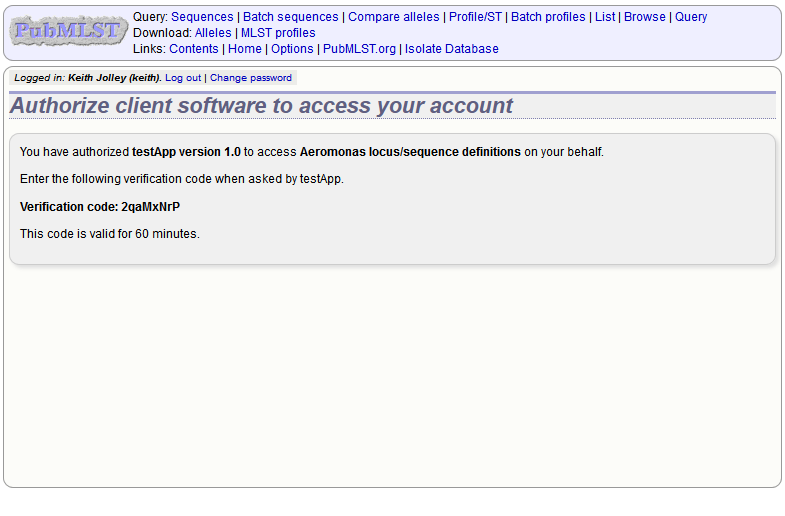 Provides information about a locus, including links to allele sequences (in seqdef databases). added_after [date] - Include only alleles added after specified date (ISO 8601 format). updated_after [date] - Include only alleles last modified after specified date (ISO 8601 format). alleles [array] - List of URIs to defined allele records. Pages are 100 records by default. Page size can be modified using the page_size parameter. added_after [date] - Include only profiles added after specified date (ISO 8601 format). updated_after [date] - Include only profiles last modified after specified date (ISO 8601 format). profiles [array] - List of URIs to defined profile records. Pages are 100 records by default. Page size can be modified using the page_size parameter. primary_key_term [string/integer] - The field name is the primary key, e.g. ST. The value is the primary key value (primary_id used as an argument). other_scheme_fields [string/integer] - Each scheme field will have its own value if defined. The field name is the name of the field. added_after [date] - Include only isolates added after specified date (ISO 8601 format). updated_after [date] - Include only isolates last modified after specified date (ISO 8601 format). isolates [array] - List of URIs to isolate records. Pages are 100 records by default. Page size can be modified using the page_size parameter. loci_designated_count [integer] - number of loci within scheme that have an allele designated for this isolate. allele_designations [array] - List of URIs to allele designation records. Pages are 100 records by default. Page size can be modified using the page_size parameter. allele_ids [array] - List of allele id objects, each consisting of a key/value pair where the key is the locus name. Pages are 100 records by default. Page size can be modified using the page_size parameter. allele_designations [array] - List of allele designation objects for each locus in the specified scheme that has been designated. allele_ids [array] - List containing allele id objects for each locus in the specified scheme that has been designated. Each allele_id object contains a key which is the name of the locus with a value that may be either a string, integer or array of strings or integers (required where there are multiple designations for a locus). The data type depends on the allele_id_format set for the specific locus. contigs [array] - List of URIs to contig records Pages are 100 records by default. Page size can be modified using the page_size parameter. header [string] - either ‘original_designation’ or ‘id’ (default is ‘id’). This selects whether the FASTA header lines contain the originally uploaded FASTA headers or the sequence bin id numbers. Users may be data submitters or curators. isolates [string] - URI to list of URIs of member isolate records. isolates [string] - tab-delimited isolate data - this should include a header line containing each field or locus included as well as for ‘assembly_filename’ and ‘sequence_method’. The ‘sequence_method’ should be either ‘454’, ‘Illumina’, ‘Ion Torrent’, ‘PacBio’, ‘Oxford Nanopore’, ‘Sanger’, ‘Solexa’, ‘SOLiD’, or ‘other’. Following submission, contig files should be uploaded with the same names as set for ‘assembly_filename’. This can be done using the file upload route. email [int] - set to 1 to enable E-mail updates (E-mails will be sent to the registered user account address). missing_files [array] - List of filenames that need to be uploaded to complete the submission. These filenames are defined in the ‘assembly_filename’ field of the isolate record upload. The files should contain the contig assemblies. isolates [array] - List of isolate record objects. Each contains key/value pairs for included fields. You must be the owner and the record must be closed. Developer signs up and gets a consumer key and consumer secret specific to their application. Application gets a request token and directs user to authorization page on BIGSdb. BIGSdb asks user for authorization for application to access specific resource using their credentials. A verifier code is provided. The application exchanges the request token and OAuth verifier code for an access token and secret (these do not expire but may be revoked by the user or site admin). Application uses access token/secret to request session token (this is valid for 12 hours). All calls to access protected resources are signed using the session token/secret and consumer key/secret. It is recommended that application developers use an OAuth library to generate and sign requests. Application developers should apply to the site administrator of the site running BIGSdb. The administrator can generate a key and secret using a script - both of these will need to be used by the application to sign requests. The client id is usually a 24 character alphanumeric string. The secret is usually a 42 character alphanumeric (including punctuation) string, e.g. oauth_timestamp (UNIX timestamp - seconds since Jan 1 1970) - this must be within 600 seconds of the current time. This is the request token. It is usually a 32 character alphanumeric string. This is the secret associated with the request token. It is usually a 32 character alphanumeric string. This parameter is always set to true. If they authorize the access, they will be presented with a verifier code. This should be entered in to the client application which will use this together with the request token to request an access token. The verifier code is valid for 60 minutes. This is the access token. It is usually a 32 character alphanumeric string. This is the secret associated with the access token. It is usually a 32 character alphanumeric string. This is the session token. It is usually a 32 character alphanumeric string. This is the secret associated with the session token. It is usually a 32 character alphanumeric string.